Design Option / How Many Words? 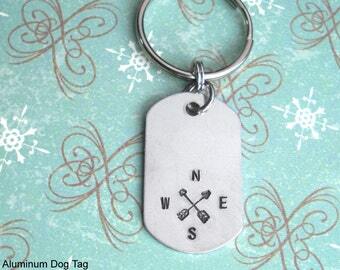 This listing is for one 3/4" disc aluminum tag with key ring. This listing includes ONE WORD or ONE SYMBOL. You can add more with additional stamping fees (see Variations during checkout). ►Genuine, solid aluminum is very light weight. ►This attractive shape measures 3/4" wide. 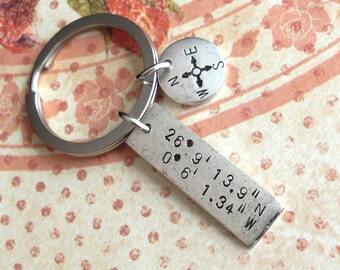 Key ring may vary from photos. 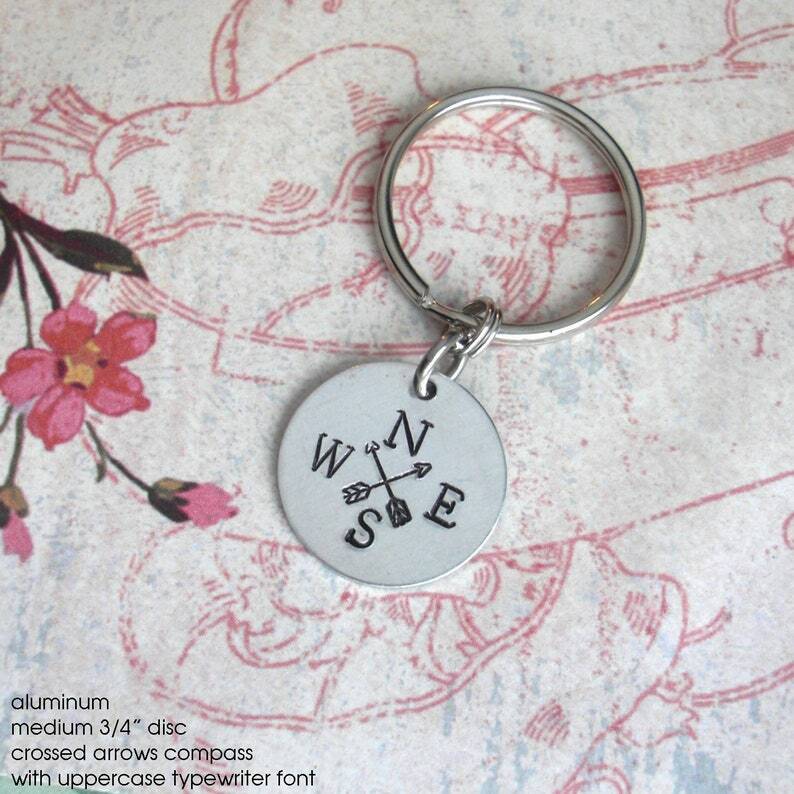 The Crossed Arrows compass design will vary slightly on each charm. The main listing photo used 1/8" uppercase Typewriter font for the N/E/S/W letters. You may also request the smaller 1/16" uppercase Arial font letters, as shown in the Compass Variety photo (shown on mini 1/2" plated discs). PLEASE NOTE: The aluminum is extremely light weight. The patina will vary on each piece, it will show very light scratches that were made during the tag's production. I cannot stamp on the back of this tag. ►Font options may vary based on how long your text is. The hearts and compass collage photos are shown on 1/2" mini discs; they are just for ideas. Your order will include 1 medium 3/4" disc. 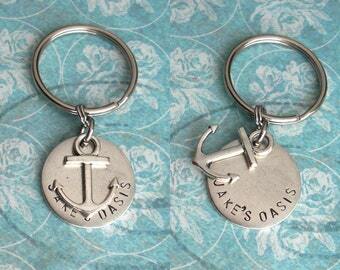 ► The "Oak Knoll School ♥" charm uses 4 words; 3 additional stamping fees would be required for this order. See photos for more examples. Please contact me with your complete details if you have questions on how it will fit and what font you can use. PLEASE NOTE: As always, each charm is stamped by hand and may not be in perfect alignment; this simply adds to the hand-made nature of your unique charm. Patina and blemishes on the metal will vary from photo. THE ALUMINUM IS NATURALLY SCRATCHED VERY LIGHTLY DURING ITS PRODUCTION. You may see some dimpling or curving of your disc depending on the size of the characters or symbol stamped. They may not be totally flat; this is a normal effect. I cannot stamp on the back of this charm, it is soft and therefore the backside will show the dimpling of stamping from the front side. Oils from your body, perfumes, lotion, air and paper may discolor your charm. Rub gently with a polishing cloth to buff. Antiquing in the stamping will wear off faster with rubbing. Do not use a liquid to clean your charm. Custom Phrase. Skinny Rectangle & Mini Disc. 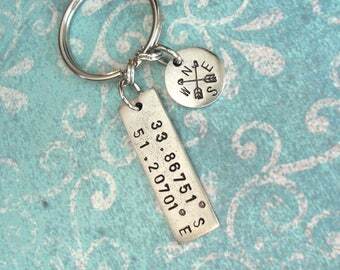 Double Charm Keychain. Boxy Camera. Hand Stamped. 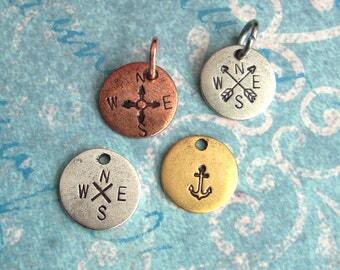 custom antiqued metal. Copper, Silver, Gold.